An estimated 2.5 million people work as in-home health and personal aides for the elderly and disabled in this country. Tasks include helping with meals and bathing, light cleaning and companionship. These services can allow an elderly person to postpone or avoid costlier nursing home care. As baby boomers age, demand for this kind of care is projected to rise significantly. But in many states, in-home health care providers earn less than minimum wage and are not entitled to overtime. What the shortage of caregivers means for patients, their families and the home health care industry. Susan Dentzer Senior policy adviser at the Robert Wood Johnson Foundation and on-air analyst on health issues for the PBS NewsHour. Carol Regan Government affairs director at PHI, Paraprofessional Healthcare Institute. Val Halamandaris President of the National Association for Home Care and Hospice. Bruce Vladeck Former director of Medicare and Medicaid during the Clinton administration. MS. DIANE REHMThanks for joining us. I'm Diane Rehm. Home health and personal care aides can make a critical difference for elderly or disabled people living on their own. Demand for these workers is projected to increase dramatically. But some say fundamental changes are needed. MS. DIANE REHMJoining me to talk about challenges for in-home help aides: Susan Dentzer of the Robert Wood Johnson Foundation -- she's also on-air analyst on health issues for the PBS NewsHour -- Carol Regan of PHI, an organization representing in-home health care workers, and Val Halamandaris of the National Association for Home Care and Hospice. Do join us. I know many of you are contemplating the same kinds of situations. Give us a call, 800-433-8850. Send us an email to drshow@wamu.org. Follow us on Facebook or send us a tweet. Good morning to all of you. Thank you for being here. MS. SUSAN DENTZERGood morning, Diane. MS. CAROL REGANGood morning, Diane. REHMGood to see you all. Carol Regan, I'll start with you. I know you represent direct health care workers. Who are they? Tell us how they range. Are they immigrants for the most part, or are they people who've been here for a long time? REGANWell, thank you, Diane. This workforce is the fastest growing occupation in the country. We talk about direct care workers. That includes nursing home workers, home care aides, as you said, personal care attendants. It's the last two that are fastest growing. There's about over 2.5 million of these workers in the country today. They're mostly women. REGANNinety percent are women. About -- only about 20 percent are foreign born. Most people have been in this country for a while. They're women. They have worked at this for a long time. They -- the situation for these workers is somewhat difficult because they're very low paid. We're talking about workers who make around $9.50 an hour. REGANIt's that. It is predominantly part-time workforce, about half work part-time. There's a tremendous amount of turnover. And when you think about what is a good job, they -- their -- in addition to their wages, I wanted to share with you that many do not have home health care insurance. And hopefully that will change in January. But the other thing to know about this workforce is that their wages are so low and their incomes are so low that nearly half live in households that get public benefits. So it's a job that's really about a calling to do this work, not about the compensation they get. REHMSusan Dentzer, explain the difference for us between home health aides and personal care aides. DENTZERWell, it's -- the boundary is really shift, Diane. And as Carol said, these people go by different names: home maker health aides, personal care aides, chore aides, nurse's aides, certified nursing assistants. And really, what they are essentially doing is supporting individuals. Now, a good deal -- a good many of them, obviously, are working in nursing homes and other institutions. DENTZERBut as Carol said, increasingly, they're working in the home. The requirements for training of these folks really are not very high. To become a certified nurse's aide, federal law requires less than two weeks of training. DENTZERAnd, of course, you can kind of hang out your shingle today as a personal care assistant and just advertise yourself for the newspaper with no training to speak of and maybe just references from others. So we have a whole array here of people who are trained, people who are semi-trained, people who are not trained at all providing these services. And, of course, very few of them, relatively speaking, are licensed, depending on the state. For example, here in the tri-state area, D.C., Maryland, Virginia, there is no licensure for these workers. REHMSo, Val Halamandaris, we've got millions of these home health care workers. What is the projection for their need in the coming years? HALAMANDARISI'm so glad you asked me the question because there is a massive need. The Department of Labor certifies this is a single category that we need more than any other job over the next 20 years. 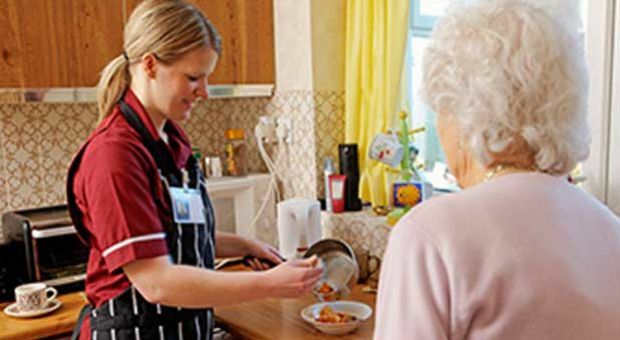 And there are very little efforts underway in order to bring qualified people into the field to perform the jobs that are being done now by the current personal care aides. HALAMANDARISSeventy-eight million baby boomers coming into their retirement years and wishing to stay well at home as opposed to being placed in some institutional setting, they're going to need help in order to stay home. So they provide personal care in the main. And if you can't get out of bed by yourself, you can't do much else. HALAMANDARISSo they help with that, getting dressed, making sure that, you know, you are fed. All of those essential activities of daily living are performed by these wonderful people. And yes, it is a calling, and that's why they do it. And it's very difficult to replace them because they have such a passion for doing what they do. REHMNow, Carol mentioned minimum wage. What do we see in the way of wages being paid? What's the range? HALAMANDARISSeven dollars an hour, yeah, but there are higher wages that are paid by private duty organizations. There are severe limits on what government will pay through the Medicaid program. And we bump up against those 'cause most states don't have the money to fund Medicaid the way they used to. So there is some variability. On the high end, there would be individuals that are paid by organizations called private duty home care. REHMAnd if you're talking about range, what is the range, Carol? Could it go from minimum wage up to what? REGANAbsolutely. I mean, it depends on the state. It depends on the agency. You know, as I said earlier, the data shows that the average wage is about $9.50 for personal care aide, a little bit higher for a home health aide. That's the average. And some places may pay, you know, $10, $12, $14 an hour. REHMAnd what does the agency make? REGANWell, that's a good point, Diane. I mean, in terms of the sort of agency-based services, those agencies may charge more, but they still pay the aide not as much. And it's a huge industry. It's an $84 billion industry. There's continuous to be growth. And if you look at the differences between what the aides make, not that much higher than that but the agencies are charging more. REGANSo I think we need to begin to look at this in terms of fairness and whether that there's resources. Val's right in that the public benefits are often more limited than not. But the other thing we need to understand, and I'm going to put this in here, is that while we may not be paying the wage we're paying, we're paying it on the back end because the turnover is about 50 percent. REGANWhy? Because they're hard jobs, they don't pay well, people can get a better job at a McDonald's or a restaurant around the corner, that they don't have health insurance. Oftentimes, particularly if you're working in a home, you don't always have the supervision like you would in a nursing home, so you're on your own. And it's very -- the other thing is it's a occupation with very high injury rates, so back injuries from lifting and whatnot. So the turnover is high, and that cost to taxpayers is high. REGANWe estimate it's about $6 billion a year. Now, that includes nursing home cost. But we're paying a lot to retrain, to recruit and to bring people back in. So at some point, we need to begin to think about -- now, we'll talk about this more -- what do we need to do to stabilize this workforce? And so that we're not paying more in the back end because of additional recruitment and turnover costs and make them really quality jobs which is what we're all going to want when we get old. REHMSusan, talk about that cost to taxpayers. DENTZERWell, as Carol said, there are other costs that she mentioned, I think, even beyond the cost to taxpayers. If we think about the cost to society, we know that a number of the disabled people in the country, whether they're elderly, disabled or younger disabled individuals, are living at home with their families. DENTZERTheir families are providing care in many instances. More than 65 million Americans are providing care at home for chronically ill, disabled or aged family member. And the economic value of that care alone is estimated at about $370 billion a year. Now, very often, the only reason those people can stay home and provide care is because they do get some assistance from a personal care aide, a direct care worker of some sort who is at least coming in periodically to spell that. DENTZERSo if we sort of add all of that up, we get the sense that there's a big economic burden being imposed on families across American from this. And we really are not looking at the future very intelligently in terms of figuring out how to supply the kinds of support that those families are going to need. REHMSo what percentage of home health care workers are operating on their own? What percentage are going through an agency, Val? HALAMANDARISThe most of them still work for an organization, and that is you have someone you can hold accountable. If they do something untoward, if they don't take as good a care of your mom as they should, there is someone you can sue. There is a rapidly growing group that are direct paid workers that you can hire individually. And then you have to accept the responsibility of screening them, supervising and training them, all of those. And that's people ought to get whatever they need. HALAMANDARISIf you're best served by going through an agency, you ought to do that. If you feel you can handle the hiring, firing and the responsibility for supervision, we're fine with doing that. The fact is the need is going to be so great and that nothing would boost our economy more. And yet, we're doing nothing to boost the supply that is needed. Massive numbers of people that are going to be needed to provide care for all of us as we gray and we're doing absolutely nothing about it. DENTZERAnd it is certainly is true that the more experienced workers often do leave the agency setting and go out on their own because they can be paid more. DENTZER$25, $30 an hour is not unheard of. REHMSusan Dentzer, senior policy adviser to Robert Wood Johnson Foundation. Short break here. When we come back, we'll talk about many of the other issues and take your calls. Stay with us. REHMAnd welcome back. We've got many callers, many emails. Here's a tweet, "Please discuss how physically demanding home health care aide work is. My sister is permanently disabled after injuring her back on the job. I made more money as a delivery driver for Papa John's than my sister made as a home health care aide." Carol. REGANSure. It's -- we -- I'm sorry to hear that for you sister and we hear many, many stories like this. It is true. This is a job that has higher rates of injury than mine workers. It's stunning. And a lot of that is because, as the caller mentioned, heavy lifting. You're often on your own. If you're in a facility, like a nursing home, you'll have Hoyer Lifts or things like that. If you're in someone's home, you often have to do it on your own. REGANAnd back to what Susan mentioned, if you're not given the right training in how to lift appropriately, then you really can injure yourself and maybe even injure the consumer. So we have a lot of muscular skeletal injuries, sort of back injuries and other injuries that are -- that can sometimes be debilitating. REHMAnd joining us now from New York is Bruce Vladeck. He's former director of Medicare and Medicaid during the Clinton administration. Good morning to you, sir. MR. BRUCE VLADECKGood morning, Diane. How are you? REHMFine. Thanks. Bruce, talk about how Medicare covers home health care aides and/or personal care aides. VLADECKMedicare covers home health care aides or home attendants only to a very, very limited extent. If a patient is eligible for Medicare-covered skilled home care, which is a pretty constrained benefit to begin with, and they require, in addition to the services of a registered nurse or a therapist, assistance with activities of daily living, then Medicare will, in those instances, pay for personal care or home attendant for a limited period of time. REHMOr on a very limited basis? Will it cover the entire cost or just a portion thereof? VLADECK...generally a very limited period of time. REHMI see. What about Medicaid, Bruce? VLADECKWell, Medicaid is our major source of financing for a whole range of services that there's no other source of paying for. And it is also a resource for middle-class families who are never eligible for Medicaid before somebody requires extensive, long-term care because hardly anyone can afford the cost of taking care of a very frail, old person 365 days a year so that Medicaid is, by far, the largest supporter of services not only for long-term care for the elderly, as Susan pointed out, for services, for permanently disabled people. VLADECKIt's the major source of financing for services for people with developmentally -- developmental disabilities, for people with serious and persistent mental illness, all the populations of people who need continuing, ongoing care that no family can sustain indefinitely. REHMSure. Now, explain for us, if you would, this so-called fair labor exemption. I don't quite understand how and why that came into being. VLADECKWell, the Fair Labor Standards Act is the basic law enacted during the New Deal that guarantees a minimum wage, that guarantees extra payments for overtime for employees in the United States. And since its inception, there have been a number of exemptions that the historians have increasingly documented were protecting special interest of one kind or another. VLADECKThe original companionship exemption was created so that -- excuse me -- so that upper middle-class people paying nannies or housekeepers or maids wouldn't be subject to the minimum wage or overtime requirements. And over the years, the Department of Labor has interpreted home care workers in what to me is a defiance of all logic as being in the same category as babysitters in effect. REHMSo what you end up doing is paying these very low wages to mostly low-income people and mostly women. You end up paying them less than a fair wage for some of the hardest work there is. VLADECKNot only that, but you also almost invariably pay them no benefits or very limited benefits. And most significantly again in terms of the current legal situation, you don't pay them overtime. You generally don't pay them for the amount of time it takes them to get, if they're covering more than one patient a day, from one place to the next. And we've built a very lucrative and extensive business, as Carol cited, $85 billion a year or something of that affect on the backs of these women. REHMSo isn't there some effort underway now to mandate a higher minimum wage for those who are working in this industry end up being paid under Medicaid? VLADECKWell, more than a year ago, President Obama announced a proposed rule changing the regulation. The Department of Labor regulations, under the Fair Labor Standards Act, to remove the companionship exemption for home care workers. And it's been through an extensive public comment periods, been through all kinds of discussions and analysis. And as a legal matter, as an administrative matter, the administration has the authority on a day to go ahead and publish the final rule to that effect in the Federal Register, and it's about time they did. REHMI understand there have been something like 126,000 comments on this? REHMYeah. So if that exemption were removed, how would that affect states who were currently dealing with their own Medicaid problems? VLADECK...to the home care agencies. It's paying a rate that includes administrative cost and profits and things of that sort. So, I mean, the first instance if I were running a state Medicaid program and my agencies had to pay an additional dollar an hour or whatever, I would want to tell them I'm paying you the same. You take the dollar an hour out of your administrative cost. If, you know, in some cases, the states have been paying so little that it would probably require them to spend some more money. REHMOK. So if you remove the exemption for a companionship worker, what's that going to mean to that worker in terms of the income she earns? VLADECKWell, again, it's going to vary a lot by states because something like 20 states already provide minimum wage guarantees to home care workers, although most do not pay -- do not guarantee additional overtime. But if you look at comparisons to the extent that we have the data, which is very limited, it does suggest that people in states that pay better stay in the jobs longer, acquire more experience, provide a more stable workforce for the clients than those in the lowest paying states who leave every time there's an opening at McDonald's because they can move up in the world. REHMSo, ideally, what would you like to see happen? VLADECKWell, I think removing the companionship exemption is a first step. I think we still have a long way to go in improving the training and supervision of home care aides, home attendants, personal care aides throughout the country. I think there needs to be a public investment in improving the quality of services by improving the quality of the jobs of the people who give most of the services. VLADECKThis is one of these areas in which we've let the political rhetoric about low taxes obscure the extent to which, you know, millions of Americans are dependent on what is, in effect, the economic exploitation of people who give over and above what an economist would reasonably expect of them because they're good, caring people, and we take advantage of that. We walk all over them in public policy so people can run for re-election saying they cut taxes. It's really, to me, just a horrible ethical circumstance. REHMIs there any indication that the Obama administration is prepared to move soon on this issue? VLADECKWell, on the particular regulation, I must confess mystification as to why they haven't moved already. And it's making those of us who are advocates for the new regulation extremely nervous because there's no reason that we're aware of substantively to hold it up any longer. And so it suggests to us that some interest groups are throwing their weight around in such a way that they're gumming up the work. REHMSusan Dentzer, what's going on here? DENTZERWell, I don't have anything to add to what Bruce said about the -- that particular issue. But what I will say, to build on his points about the irony of federal policy here, we do know that a major thrust of federal policy now is to move care out of institutions into the home. A number of demonstration projects and the Affordable Care Act, Independence At Home, Cash and Counseling, incentives for states to shift people out of nursing homes and into so-called home- and community-based services -- that is the thrust of federal policy now. DENTZERSo we have this major effort to move people out of institutions into homes and really no concomitant effort to raise the quality of the workforce or the pay of those who are going to provide the care. REHMAnd you're listening to "The Diane Rehm Show." Carol, do you want to add to that? REGANI would love to. Thank you. I think what Susan mentions about the transformation going on in our health care system, it just is another reason that we need to begin to invest in this workforce. REGANI want to go back and just say something about companions because these women are not companions. We're not talking about people who occasionally stop at somebody's house to play cards or to do an errand for them. These are women who do bathing and personal intimate care, some household tasks, but, you know, dressing, meals, medication, et cetera. And so they are professional women who do this work. And so I think we need to really put aside that category of companion. REHMHow did that category get categorized? REGANRight, right. Well, I think when you think back -- and I, you know, sort of can defer to Val here too -- when you think back on the industry when they last changed this rule in 1974, where they added in domestic workers, they still consider -- the industry was mainly institutionally based. It was in nursing homes. REGANWe maybe had a couple hundred thousand of these workers. And so they were still considered more occasional workers. But as Susan said, it is a major shift in the past years. Now, two-thirds of people want and are getting their care at home, so it's gone from a couple hundred thousand to over 2.5 million. HALAMANDARISWell, there are people that are properly companions. That's what they do. And they are there in the case of trouble to call someone. They're there to watch your mom, your dad. REHMYou're saying they're just sitting there. REHMHow many are there who are just sitting there? HALAMANDARISThe best estimates for the number of companions are 200,000 companions. REHMCarol, do you agree with that number? REGANI don't know about that. I mean, I know that of what we know and what we track in terms of what BLS tracks, most of them are providing more than just occasional services. HALAMANDARISCan I jump in and say that if people are providing health care services and are helping with personal care, they deserve overtime? We do not disagree with that at all. But there is a category of individuals who work literally as companions. I don't hear any companion say, I'm so overworked. I've been watching Mrs. Smith all day long. The phone never rings. I get to do my knitting, but that's pretty boring. I mean, it's the kind of work that's important because you have to make sure your mom is cared for. Something happens, call somebody. DENTZERBut we can tell that that's clearly fewer than one out of 10 of the people who are actually in these direct care occupations. And just to give you a sense, here's a typical day for a direct care worker. Here's a profile I read recently of somebody who was caring for a disabled middle-aged man. So she arrives at 9 a.m. He's in bed. He weighs 200 pounds and is 6-foot-4. She's 4-foot-11. She empties his catheter bag. DENTZERShe gives him a bed bath. She dresses him. She helps him through an exercise routine. She helps lift him with a mechanical lift, as Carol described earlier. She gets him out of bed and into his wheelchair, feeds him breakfast, combs his hair, helps him with his exercises. That's not companionship. That is real direct personal assistance. Yeah. HALAMANDARISWe agree. We agree. That's what my mom did for my dad, by the way. And -- but there are companions. Literally, the word is used on purpose. I helped write that when I was part of the Senate Committee on Aging. And why should they be paid overtime if the only thing that you're there to do is to watch? You know, what is the rationale for requiring them to be paid overtime? REHMBruce Vladeck, do you want to get in on that? VLADECKYeah. Well, if somebody's really a companion, first of all, none of the insurance programs, either public or private, will pay for it. So it's effectively an unregulated business. But I have no problem with exempting whatever the equivalent worth is of babysitting for -- whether it's elderly sitting or whatever if that's, in fact, what it is. REHMBut who is it who decides what to call it? VLADECKWell, that's a -- you know, there's 1,000 lawyers between the Department of Justice and the Solicitor's Office and Department of Labor who can write the language to insure the people Val is talking about, most of whom, I would bet a substantial amount of money, are working entirely off the books anyway. REHMAll right. And, Bruce Vladeck, thank you so much for joining us. Short break, right back. REHMAnd if you've just joined us, we're talking about home health care workers -- people who care for the elderly, for the disabled. Their numbers are going to grow because the baby boom generation is on the verge of needing this kind of care. Training for these workers is very iffy. Some go through agencies, some work on their own. REHMHere's an email from Catherine, which says, "Not only are health home aides being paid less than fair wage, they're being paid less than our local babysitters as well as the day laborers who congregate around our convenience store. I live on Long Island. Teenage babysitters in my area are paid $15 per hour." What about that? HALAMANDARISWell, there are companions that are paid $15, $20 an hour as well. It's variable depending on what the market will bear. You raise a really excellent point, though, when you talked about the fact that an agency which pays $12 an hour was being paid $20. Now, the question is, what do they do with the difference? HALAMANDARISIs that profit, or does that go for the administrative expense for salary, health care benefits? If it's being used to provide health care benefits, then I think it's fully appropriate. Any organization that does not provide health care benefits for its aides or its nurses, I believe, should reconsider and reconsider it quickly. REHMHow often are health care workers paid benefits themselves? REGANWell, unfortunately, in this sector, not very many. For personal care aides, one out of three is uninsured. Some, because their incomes are low, will be picked up by Medicaid, and if states expand Medicaid under the Affordable Care Act, many more will get that coverage. And we would hope that, you know, that the employers who are offering it now will continue to offer it and that many of these workers will get coverage through public programs in the exchange. REGANI'm going to come back just one quick thing about the companions 'cause I think what's really important here is that if you're really a companion, you're probably working part-time. The industry we're really talking about is the people who need the care and that will be affected by the Fair Labor Standards Act. Not many get overtime right now. It's about, you know, maybe eight to 10 percent get overtime. REGANAnd for those, they really end up caring for the most, as Susan mentioned earlier, the most needy families who have chronic illnesses, disabilities. And so the companionship is really, I think, a misnomer because if you're really doing babysitting or companion, you're not going to be eligible for overtime anyway because you're not working that many hours. DENTZERI think it's also important to remember a little bit more about who this population is. As Carol said earlier, a lot of them have been previously on welfare. Many of them are single mothers, so they're struggling to support their own families. They're not highly educated. They really are quite vulnerable in the system. Sometimes this kind of a position is the only thing that they can get with their level of skill and training. DENTZERAnd because there is no system that sort of takes them where they are and trains them further and invest in them further and gets them to the point where they could earn more and charge more, we really, as Bruce said earlier, have this large pool of people who we -- I think the word that he used, exploitation, is really an apt description of what's going on. REHMAll right. To Fayetteville, N.C. Good morning, Michael. MICHAELGood morning, Diane. How are you doing? MICHAELGood. I've been a nurse in the home health field for about three years now, and I can attest to all of this. Home health is very unregulated. It's very -- not a lot of training going on, not a lot of personal accountability. I say it's one of the most dangerous parts of the health field there is. MICHAELIt's dangerous because most of the time when I'm working, I'm in there by myself, no support at all. Supplies don't come in when they're supposed to. I remember I had a patient that didn't have their basic trach care cleaning supplies for three weeks. I would call and cry trying to get this stuff. I would have to go to the store myself, pay for it out of pocket just so this kid could have a clean airway. MICHAELI mean, it happens. I'm trying to get out the game myself. I can't stand it. I'm tired of it. I'm trying to get into an admin job. And if you know anybody that could hook me up, let me know. REHMAll right, Michael. Good luck to you, and thank you for the work you do. How typical is that, Carol? REGANUnfortunately, very typical, and thanks for calling in, Michael, and sharing your story. It is -- people want to do this work, but it's hard work. A lot of the work we do at PHI is directly working with employers to help them train supervisors to be good supervisors, to help, you know, train workers, to give them the kind of support they need. REGANSo it's really an important element to why people will stay in the job. But what Michael is saying is true between the at-risk, and we hear it over and over, people will go out and buy supplies on their own, will bring in bathing supplies, et cetera, above and beyond because they care for these families. REHMAll right. To Boston, Mass. Good morning, Paul. PAULGood morning, Diane. And thank you very much for taking my call. PAULFirst, I would love to compliment your panel. They're well at verse, professional and dedicated to this field. I own an organization, and I've been in business for 13 years and employ 240 people here in South Shore, Boston, Mass. And I am dedicated 150 percent to these people in the field because, as your panel has so openly stated, they are of great need. They have been labeled as angels but yet have been given and governed with a financial amount of income less than the livable wage. PAULI have employees right now that cater to these people in snowstorms. They're essential human beings. We just had a major dilemma here in Boston where the city was shut down, and yet, our people are on the phone calling the clients, making sure that their needs was trying to be met. And overtime, forget it. I mean, it went out of control with my staff making sure that we stayed on the phone with these people throughout the times. PAULThe most important thing I see is I cannot -- I work the streets. I cannot get involved in a political aspect of it. I need your panel to continue on going after the essentials we need. But let me just inform you, I pay my people basically about $12 an hour, and that's of an income of $22.35. Now, I know a question was brought up to say pay was given at $12, and $20 is what the billable rate is. REHMSo -- excuse me. So you are paying for them to have vacation time and sick leave? REHMAnd holiday time. I would say good for you. How often does that happen? HALAMANDARISIt happens a lot. Unfortunately, in some areas where we have direct care workers, it doesn't happen at all. So this is a very complex problem. We have to do more. They are angels. They do work hard. That's the thing that we should not lose track of. PAULAbsolutely. Absolutely. I don't mean to jump in over Carol, and I apologize for this, Carol, please. But the thing that we look at -- I mean, we cannot allow, just because of aging, to lose our dignity. We got to make sure that these people that are essentially out there doing this work are given a rate of income that they can support their own family. REHMOK. Now, Paul, let me ask you a question. Supposed this exemption goes away and you are forced to pay overtime, is that going to mean that the number of people you hire will actually decrease? PAULWell, I'm going to be exact on that point directly to you, Diane. I pay overtime right now because of the fact that I cannot afford a turnover in this -- in my business as the market is sharing right now, 50 and 60 percent all are turnover. As Bruce says, they go to McDonald's as quick as you get them. I train my people here. I need the exemption to be in our favor because I need to raise their level. So I will continue on fighting for everything I can possibly get for the people in the field. I am not a provider, and I welcome anyone to come to my establishment here in South Shore, Boston. REHMAll right. Paul, thank you so much. I'm glad to hear about your work. Let's go to Tryon, N.C. Good morning, Kendall. KENDALLGood morning, Diane. Thank you very much for taking my call. KENDALLI'm so glad to have heard you discussing this subject. I am a private care worker. I've been doing this for about five years now. When I started out, I guess I was doing what you would call for companion work. I was helping a friend of mine's mother. I would take her to do errands. I would, you know, that kind of work. KENDALLI was getting paid $10 an hour. KENDALLI am now in the process of trying to -- as I'm now working with another -- a new client. And this is something that needs to be discussed too. These folks have long care -- long-term care insurance policy, which is supposed to cover to a certain extent the very services that you've been discussing. KENDALLThe problem is their policy will not cover private care. REHMAll right. Carol, do you want to talk about that? REGANRight. I think you're raising -- Kendall, you're raising a really important issue. We really need to begin to think about how we're going to finance long-term care in this country in a very different way than we do know. REHMWithout breaking down the whole system. REGANExactly. And the important is -- the thing that Kendall is raising is that long-term care insurances is not sufficient in this, you know, right now, not a number of people have it. And those do have it, there's often clauses that say they'll pay for institutional care but not at home care. REGANAnd the one good news -- and I hope these progresses soon, and maybe Susan can talk about this, is that the under the recent legislation, there is a long-term care commission that will be organized in this country, and they will also be tasked looking at the workforce, as we're thinking about how to finance long-term care in this country. And hopefully, we will get people around the table very soon to begin to make recommendations on how we're going to solve this long-term issue. DENTZERThat's right. That commission was created. And in the one step forward, two steps backward way of federal policy, that commission was created because the one component of the Affordable Care Act, the Community Living Assistance Services and Supports Act, which was designed to help middle-class families with some of these expenses, that was repealed, of course, at the end of last year. DENTZERSo we took that step backward arguably. And now we're back to empanelling this commission that is, in fact, up and running now and asking them, OK, now, what? And in particular, as Carol said, what about the workforce because we do need to finance this but we also need people to actually to provide this care? HALAMANDARISThe U.S. has no policy in terms of how we're going to care for our acute long-term elderly. Every other society had a policy. The ancient Greeks, the ancient Chinese venerated the elderly to the end of their days. JFK, President Kennedy, said that we needed to that. It was a moral issue. He said, what is at stake is the very longevity of American democracy and how we're going to be viewed for the prism of history. HALAMANDARISThis is an issue that I worked all of my life to help make a difference in, and thanks to all the people at this table and millions of others, we've done it, but it's a good starting point. REHMAnd you're listening to "The Diane Rehm Show." Let's go now to St. Louis, Mo. Good morning, Carl. CARLGood morning, Diane. My question is a little off topic. It has to deal with the insurance companies themselves. I know that in certain cases, a life insurance company with high-profile client will require that client or even provide to that client a bodyguard to help mitigate their risks. Don't the insurance -- the medical insurance companies have a similar vested interest in providing these home health care workers in order to mitigate their own risk? They're paying for the high cost of care for a total hip replacement, for instance. HALAMANDARISYou would think so, but I don't know of one that has done that. REGANWell, and just to pick on what Val is saying and Susan mentioned earlier is that in the Affordable Care Act, we have a lot of opportunities to change the way the health care is delivered. And as we go into more managed care or accountable care organizations and health homes, I think that the system will have an incentive to use this workforce in a very different way than they have as part of the care team, as part of a way to help with care transitions, to help prevent re-hospitalization, which cost the system a lot of money. REGANAnd these are workers who were in people's homes every day. And, you know, if I were advising the insurance companies, I would ask them to begin to look at this workforce as not only a cost saver but as something that is a quality investment. DENTZERAnd create new opportunities for different types of workers. DENTZERArkansas is a state that in its Medicaid program has trained community health workers to go out and do assessments of the needs in homes and be a liaison for families who are caring for seriously disabled individuals. So there are lots of employment opportunities here. We just have to get on devising the system to train these workers, to credential them, to license them where necessary and ensure quality. REHMAnd do you see anything in the Obama health care plan that goes into effect 2014 that will have a direct impact on home health care? DENTZERWell, the things that we've mentioned. First of all, the general tie that is pushing care out of institutions and into homes that clearly will support this effort. And then as we've mentioned now, we have this workforce commission, which didn't come out at the Affordable Care Act but came out of the demise of a piece of the Affordable Care Act, which I think now holds the potential to do another serious assessment about the needs and start to lay the groundwork for policies to address them. REHMHow much fate do you have in that, Carol? REGANRight. Well, a lot of fate actually. I see some really interesting innovative changes going on around the country around this. And in addition to sort of this expansion of home and community-based services, two other things that I think we can expect out of the Affordable Care Act. One is the health coverage, which we mentioned earlier. And I'm hoping that many, many thousands of workers will get health insurance. But the other piece is there was an investment in these training grants. REGANSix states have demonstration grants to develop a core competencies, a curriculum and to pilot training for personal care assistance. Their recommendations are due to HHS this fall. And then hopefully, that will be a gold standard for some minimum training for personal care attendants, so I'm hopeful on that. REHMYeah. Carol Regan, she is government affairs director Paraprofessional Healthcare Institute, Val Halamandaris, president of the National Association for Home Care and Hospice, Susan Dentzer of the Robert Wood Johnson Foundation, on-air analyst on health issues for the "PBS NewsHour." Thank you all so much.